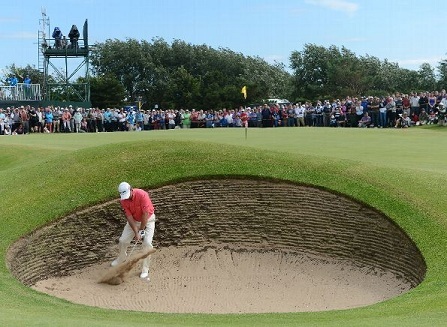 I suspect that many golfers were surprised to see that all the bunkers were in play during the Open Championship at Royal Lytham St Annes last week, as many of them contained deep puddles. However, the Rules of Golf provide for casual water in bunkers and there is no reason to declare them out of play unless they are completely flooded. I am aware that some Club Committees make a Local Rule allowing a player to drop out of any bunker filled with casual water, without penalty, despite this being against the Rules of Golf (Decision 33-8/27). I covered this subject, including the relief options available to a player when their ball lies in casual water in a bunker in an earlier blog, Casual Water in Bunkers - Rule 25-1b(ii). If you were watching last week’s enthralling golf at Lytham, you will probably have seen a number of situations where players found their balls at rest in casual water in bunkers, or in very difficult lies in the saturated sand. I witnessed three interesting situations, which caused me to query the decisions made by the players and their caddies in these circumstances. The first concerned Graeme McDowell on the final day, when his ball was on lying on the left side of a greenside pot bunker, close to the stacked turf face. He had a very limited stance available inside the bunker and wisely decided that he would not be able to get enough lift on his ball to clear the lip and run it towards the hole from that position. He did have just enough backswing to move his ball sideways into the middle of the bunker, which is the option that he chose (see photo). Now, I realise that there is a world of difference between the skills of a professional golfer as compared to a high handicapper, but I still question whether he would not have been better to deem his ball unplayable and drop a ball in the bunker within two club-lengths, not nearer the hole. Surely, there would have been less risk involved in choosing this option despite the chance of his ball settling a little in the wet sand? On the same day, Tiger Woods was faced with a very similar situation when he was still in close contention for the title. However, instead of taking one of the relief options available under penalty he chose to smash his loftiest wedge into the wet, clinging sand beneath the ball. His ball bounced back off the turf sods, just missing him, which would have been a one stroke penalty, and landed in an even worse lie against the left face, so close that he could not take any kind of stance in the bunker. There is a wonderful picture of the stance that he was forced to take outside of the bunker, with a full commentary of his predicament at this link. Tiger’s next stroke almost cleared the bunker face, but was diverted way to the right, stopping on the edge of the putting green, 50 feet away from the hole. The result was a 3-putt, triple bogey for the hole, effectively ending his chance of winning. As we know, hindsight is a wonderful thing, and of all players Tiger knows the phenomenal shots that he is capable of. But I am sure that I am not the only one that thought that as with McDowell, he should also have taken the option of dropping his ball in the bunker within two club-lengths not nearer the hole, for a one stroke penalty, before playing that first, almost impossible shot. Of course dropping a ball in the wet sand can provide its own problems. If a ball is lying on top of the sand it is tempting to try and play it out wherever it lies rather than risking the ball plugging when it is dropped from shoulder height. This is why I was surprised to see Rory McIlroy, having taken the free relief option from casual water in the bunker, standing just outside of it to drop his ball into it. It was not a pot bunker and I doubt whether he was standing more than a foot above the level of the sand, but there is no point in dropping a ball from a higher point than you are required to, especially in the wet conditions prevailing. Some players think that you have to face the hole when you are dropping a ball, but this is not correct. The Rules only require that the player must stand erect, hold their ball at shoulder height and arm’s length and drop it (Rule 20-2a). I hope that, like me, you enjoyed another wonderful Open Championship. It was heart-rending to witness Adam Scott’s last four holes, but I was delighted that it was Ernie Els that came through, one of our sport’s great ambassadors. 999 questions and answers on the Rules (with references to the Rule/Decision) for just $9.99. Click here. Because you were watching the tournament on British Television you would not have heard the comments on American TV by Paul Azinger concerning the options available to McDowell. Azinger kept complaining that McDowell should invoke the option of declaring the ball unplayable and dropping outside of the bunker incurring a penalty stroke. Of course, Azinger was confusing a relief option from casual water in a bunker with the relief option for a ball unplayable in a bunker. Yes, I have received the same comment from other readers. BBC TV did have Ian Pattinson from the R&A in their studio, as their advisor on the Rules, but he was not used much while I was watching.